Wir veröffentlichen die Pressemitteilung, die auf Englisch zum Abschluss des internationalen Antiatomcamps in Narbonne, verfasst wurde. Das Camp war inhaltlich sehr spannend, mit Inputs aus zahlreichen Ländern. Berichte werden folgen. 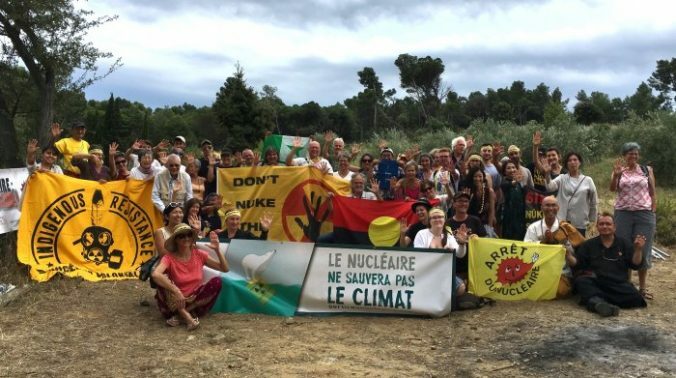 Narbonne– During this week of the 73rd anniversaries of the nuclear attacks on Hiroshima and Nagasaki, the International Anti-Nuclear Summer Camp takes place near Narbonne in the south of France from August 6th to 12th. Tents, performances, and debates are waking up a peaceful estate of olive trees and wild thyme. Located a few miles away from the Orano uranium-conversion facility (formerly Areva), this meeting of 12 nationalities focuses on all aspects of the nuclear fuel chain. How can the nuclear industry propagate so much new waste when there is waste that has not been properly cleaned up at uranium mines, nuclear weapons facilities, and nuclear power plants? Why does government allow the nuclear industry to continue, knowing the health and environmental dangers, as well as possible terrorism risks? How do private interests suppress democracy and human rights? What are the solutions to fight against nuclear proliferation? How can we separate nuclear energy into « civilian » and « military » uses? To address these shared problems, the International Anti-Nuclear Summer Camp has designed a week’s long program filled with workshops, discussions, film screenings, debates, activist formations, site visits, music, street actions, and two commemorations for the bombings of Hiroshima (August 6) and Nagasaki (August 9). This year, several guests, including nuclear workers, activists, community organizers, and members of civil society are speaking to share experiences and information about nuclear activities in their respective countries of: Belgium, France, Germany, India, Japan, Navajo Nation (Indigenous Nation of Turtle Island), Portugal, Russia, Spain, Turkey, United States, and Vietnam. All share a common diagnostic: from uranium mines to radioactive waste, the entire nuclear chain is extremely dangerous, is too expensive, anti-democratic, and cannot be a solution to climate change. This international dialogue depicts an unforgiving reality of the violence created by the nuclear industry and lobbies all around the world. Simultaneously, this international meeting gives a wondeful optimistic outlook: everywhere, resistance is rising. All around the world, courageous people are struggling against a deadly industry and promoting ecological energy transition.